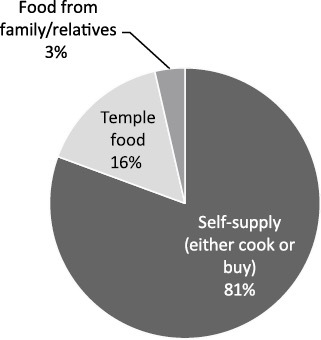 This article, based on field research in temples in urban areas of Cambodia, aims to examine the roles of lay ascetics in Cambodian Buddhist temples from the viewpoint of the food supply system for temple residents. A number of Cambodian Buddhist temples are not only monasteries inhabited by monks but also residential places for laypeople of various categories, including female ascetics called daun chi. Cambodians in general view lay ascetics as needy people who have no family to rely on in their old age; most monastic laypeople are elderly. In reality, if we focus on food, we can see that lay ascetics do not depend entirely on the temples in which they live. From detailed observations at three temples in Phnom Penh, it is clear that temples are supported by the Buddhist community in general but that food for monks and laypeople comes through different systems of supply routes that are partly connected to each other. This article first explores how these two different food supply systems are run and maintained. Second, by depicting how female ascetics get involved in food-related practices, this article examines their dual position: female ascetics are temple residents just like monks but remain in the lay category. In Theravada Buddhist societies, which consist of people ordained as monks and laypeople, what kinds of roles are played by lay ascetics living in temples? While there have been countless studies on Theravada regions in Southeast Asia, studies that focus on laypeople in particular, especially those based in Cambodia and Laos, are very scarce. Lay ascetics1) have mostly been described as part of the faithful lay community or just mentioned on a footnote level as temple inhabitants who are subordinate to monks. While so-called revival movements of the bhikkhunī (fully ordained female monk) order have recently taken place in Sri Lanka and Thailand, no such movements have occurred in Cambodia so far. It is believed that Cambodia has never had bhikkhunī,2) but it has female renouncers in the lay category called daun chi (ដូនជី) or yeay chi (យាយជី).3) There are some research works that focus on daun chi. Nobue Hamaya (2004) has carried out fieldwork on daun chi in Siem Reap and described their temple life, including their social engagement. Elizabeth Guthrie (2004) has provided historical analyses of laypeople’s practices based on the key word “puos (បួស)” and focused on one daun chi, who was a meditation teacher. The Buddhist Institute, Cambodia (2006) has surveyed daun chi life in one district and submitted concrete data on female renouncers’ attributes. All of these works have given us thought-provoking analyses and presented new findings, but we still cannot see clearly who lay ascetics are and what it means to live as a temple resident within the lay category. For example, ANLWC,4) a socially engaged Buddhist group that Hamaya wrote about, is unique to Cambodia, but its activities are very limited in region and even its name is not known widely among daun chi in general. As far as I have observed, most lay ascetics are not social workers or meditation teachers or Buddhist university students but seem simply to live in a temple. Therefore, to understand the general situation of daun chi, focusing on a particular group or prominent persons is probably not enough. What kind of human relationships do they have within a temple community? In order to understand lay ascetics better, we probably need to not only focus on daun chi but also observe a temple as a whole, including monks and other people. This article focuses on, among various aspects of Cambodian Buddhist temples, food supply for temple residents, placing an emphasis on the roles and practices of lay ascetics. I use the word “practices” here in a broad sense; it means not only, for instance, purely religious practices in search of enlightenment, but also daily activities in Buddhist temples. I try to analyze Cambodian Buddhist temples through the real lives of lay temple inhabitants in order to understand how the religion “lives” in today’s Cambodian society. It has often been said that in Theravada Buddhist societies, temple going is part of people’s everyday lives—and Cambodia is no exception. More than 90 percent of the total population of Cambodia is thought to believe in Buddhism, which is the national religion as defined in the Cambodian constitution. In fact, people have a number of occasions to visit Buddhist temples—such as during Buddhist festivals, most of which are national holidays. On a “precept (p. sīla)5) day,” which occurs four times in the lunar calendar, temples in both urban and rural areas are crowded with people gathering to “seek precepts (សុំសីល)” from monks. As a daily practice, many families place freshly cooked rice and other food in the alms bowls of monks who come to their threshold in the morning. It is very common for laypeople to invite monks to chant at rituals held in their homes, including funerals, memorial rites for the deceased, and ceremonies wishing for a long life for living parents. Temple-goers tend to be middle-aged or elderly. The institution of the Buddhist temple has much to do with people’s life stages. In other words, Cambodians have a clear idea that their life as older people will naturally entail activities such as visiting a temple to listen to monks’ dhamma talks (សម្ដែងធម៌), receiving and keeping lay precepts, serving the monks by doing chores in a temple, preparing for festivals, and even becoming lay ascetics or monks living in a temple. These activities, especially those occasions where laypeople have contact with monks, have one practice in common: offering food to monks. Besides placing food in the monks’ alms bowls, which is the most direct act, people also bring food to monks on precept days. In addition, when people invite monks to their houses to chant, if the monks are there before noon they are always offered a meal. This view of the relationship between monks and laypeople can also, in general, be applied in Cambodia. So what about lay ascetics? They live in temples but are not ordained as monks, so they cannot go out for alms. Sumiko Yamazaki (2011) provides a unique analysis of conflicts in Buddhist communities about food gathering/offering activities in a Lao-speaking area of Stung Treng Province, but she takes into account only food for monks, not food for lay ascetics. (3)	interviews and questionnaires with all inhabitants—including monks and lay ascetics—at all 48 temples in Kien Svay District, Kandal Province, conducted in August 2009 and August 2010. Although the third set of interviews and questionnaires included rural areas, it should be noted that my research targets in the first and second sets were limited; I took up only the city-type temples in Phnom Penh with a relatively large population of daun chi, so some of the findings shown in this paper might not be observed in rural areas. A voatt’s compound normally contains the main hall (ព្រះវិហារ, p. vihāra) with a sacred area (p. sīma) marked by sacred stones buried underground, where ordination ceremonies are held; the monks’ dining hall (សាលាឆាន់11)), where laypeople gather on precept days and for various other ceremonies; and the monks’ huts or dormitories (កុដិ, p. kuṭi). Many voatts have a public school that adjoins the compound or is located inside it. Some, although not many, also have a crematorium. According to the data collected in Kien Svay District, Kandal Province, in 2009—when I visited all 48 temples in the district—there were 1,182 residents. Among them, about 40 percent were born in the 1980s and about 50 percent in the 1990s. In other words, the majority were in their twenties or teens. This age imbalance was observed also in Kampong Thom Province, where Satoru Kobayashi, a member of our joint research group,14) obtained a similar result in his data in the same year; most monks were sāmaṇera or young bhikkhu under the age of 30. Because the same disproportion in age was observed in both semi-urban (Kandal) and rural (Kampong Thom) areas, it is strongly suspected that this is a nationwide trend. (5)	People with long-term illnesses (male/female). Not all temples have people in all the above categories. For example, the people in the first category are concentrated in a limited number of temples, especially in urban areas. In the second category, not all achar and temple committee members stay in the temple compound permanently. Most of these people live in their own houses and commute to the temple. People in the third category are commonly seen in urban areas, while people in the fourth category are seen at a limited number of large temples. The fifth category is a rather rare one in Cambodia: such people are observed only in a temple where there is a monk who is famous for his special ability to heal sicknesses. The first category is taken up for analysis in Section IV, since the people in this category are most numerous among the lay residents in temples. According to vinaya, Theravada monks must live on food offered by others; therefore, they do not purchase food, engage in farming, or hunt animals by themselves. In other words, monks’ lives are entrusted to laypeople. Usually monks have meals twice a day, with the second one finishing before noon. They have breakfast around 6:30–7am and lunch around 10:30–11am. From noon until the following morning, they are allowed to ingest only liquids. While alcoholic beverages are all prohibited because they can prevent monks from thinking clearly, there is no restriction on the intake of food, including meat and fish. Thus, monks are not allowed to choose what they can eat. As a general rule, monks as a group go out to practice mendicancy from house to house in the morning, shortly after nine o’clock. The food that they collect in their alms bowls is supposed to be their lunch for the day. Laypeople prepare freshly cooked rice and other dishes for monks; they do not give leftovers from the day before. Rice is put directly into the alms bowls, but other food is usually put in a small plastic bag and then placed into the alms bowls or into stacked metal food containers. Sometimes the monks’ disciples who accompany this alms walk receive food from laypeople and help to carry the food containers. In any case, laypeople give food to all the monks as a group, not to the monks whom they prefer personally. For breakfast, however, monks eat simple rice porridge. The rice for this porridge, donated by laypeople or bought with donated money, is stored in the temple, so monks do not have to go out to collect it. At mealtimes all monks from the temple, except the sick or elderly, get together in the dining hall and sit at low tables in order of their monkhood status and length of service, with two to four monks at a table.17) The collected food is put onto ordinary plates. Rice is served individually, while other dishes are shared. Thus, the general rule for the monks’ daily meals appears to be: the same food, with everybody, at the same place, at the same time. Monks sometimes take meals at laypeople’s houses when they are invited to chant sutra on occasions such as funerals, memorial services for the deceased, and rituals wishing for a long life for elderly parents. If they are invited in the afternoon, however, only beverages are served. When laypeople invite monks to their homes, in addition to meals or beverages, they often offer cash in an envelope, daily necessities (candles, incense sticks, stationery, etc. ), and preserved foods (sugar, canned condensed milk, tea leaves, bottled soft drinks, etc.). People do not name the monks they want to invite but just inform the temple achar in advance as to the number of monks they need, so these meals and gifts are offered collectively to the group of monks who visit, not to preferred individuals. Since Phnom Penh and the surrounding districts in Kandal Province have a concentration of middle- and higher-level schools that are part of the Buddhist Education curriculum, where the students are mostly monks, there is a very high density of monks; Phnom Penh, with the highest density, had 57.4 monks per temple on average in 2008.21) The majority of young monks who reside in temples in the Phnom Penh area are quite busy commuting to and attending these schools, which are located in other temples or in the compound of the Ministry of Cults and Religion. They attend school every day, both in the morning until the before-noon meal and in the afternoon, except on precept days, when Buddhist schools close. Because of this learning schedule, young student monks are simply too busy to practice mendicancy in the morning. Thus, while at some temples monks take turns going for alms walks to maintain the tradition, more temples in the Phnom Penh area prepare all or most of the food for the monks in the temple kitchen instead. The cooks are laypeople; some commute to the temple and work in the kitchen voluntarily, some are allowed to live in the temple as a reward for labor, and a few others work as temple cooks to earn wages. Some female ascetics also participate in the kitchen work or take responsibility for the overall management of food preparation for monks, as shown below. “Dak ven (ដាក់វេន)” literally means to assign (dak) duties (ven) to a person or people. This phrase is not particularly Buddhism-limited but is heard very often when talking about monks’ food supplies. Even though monks’ meals are cooked in the temple kitchen, the ingredients essentially have to be offered by laypeople outside the temple. Providing monks’ food every day is a meaningful but heavy task for Buddhist laypeople to fulfill, so the local people share this burden through dak ven (assigning duties) among themselves; they take turns providing prepared food or ingredients on a regular basis so that the everyday food supply for monks is secure. There are three basic ways of fulfilling the duty: (1) bringing home-cooked dishes to the temple, (2) carrying foodstuffs (meat, fish, vegetables, etc.) to the temple kitchen and asking the temple cooks to prepare meals, and (3) bringing cash for meal expenditure and entrusting the temple cooks with shopping and cooking. Let us take Temple SD in Phnom Penh as an example. The monks in this temple have not practiced mendicancy for years, because most of them are young student monks and are busy attending school. The temple has its own kitchen and six cooks, of whom five are laywomen who live in the neighborhood and one is a female ascetic who lives in the temple. Their task is to purchase ingredients in the market and cook food in the kitchen. One cook said that the market vendors know that the food purchased by the kitchen staff is for monks, so they sometimes give additional amounts for the same price. And if the cooks need chickens, for example, the vendors choke them to death for the cooks, because they know that the cooks observe Buddhist precepts and must refrain from killing animals.22) The cooks work on a voluntary basis without a salary, but the temple subsidizes their medical fees when necessary because their health is of great concern to the temple in maintaining its meal supplies. Temple SD accepts any of the three methods of dak ven above, but the third occurs more often than the other two. In this temple, the administrative work related to the kitchen budget and dak ven is managed by the chief of the female ascetics and the vice chief, in consultation with certain temple achar. The chief keeps the collected money received from ven members and hands the daily budget, which averages 60,000 to 70,000 riel,23) to the cooks each day. A day’s ven is fulfilled by one or more families, i.e., ven members, whose leader is called “mchas ven (ម្ចាស់វេន),” literally meaning “owner of ven.” Each ven leader is obliged to fulfill the duty on the same date of the lunar calendar every month. The temple usually needs dak ven every day except precept days. Temple SD accepts irregular or partial ven as well as regular ven. For example, there are rich Cambodians living abroad who may visit this temple to fulfill only one day’s ven. On the other hand, sometimes a family is not rich enough to fulfill a full day’s ven and so would like to offer a meal to one or a few monks only. Essentially, according to the chief, any donation or form of fulfilling ven is welcomed. The 15-day phchum ben in the latter half of lunar October is a special festive period of the year. This is a significant occasion for temple fund-raising, and for laypeople it is the time for remembering ancestors and accumulating a lot of merit by donating food and money to several temples, including those in remote areas. Each temple organizes a special dak ven system for phchum ben, usually assigning duties to local people living near the temple. It is usually the lay committee of a temple that is in charge of dak ven for phchum ben.25) In rural areas, several villages (ភូមិ) may share this duty for one temple. A village is divided into several groups, each consisting of around 10 households, and the group leader plays the role of the temple ven’s leader and takes responsibility in case any group member cannot fulfill their duty. In Cambodia, ordinary laypeople (p. upāsaka [male]/upāsikā [female]) customarily keep lay precepts (កាន់សីល) at home when they get old, whether they live in rural or urban areas. There is no strict rule about the age that they should start keeping precepts, but they generally start around age 50 to 60, when they retire from taking economic or housekeeping responsibility for their family. There are two kinds of precept sets: five precepts and eight precepts. Those who keep precepts are required to refrain from the following activities: (1) killing living things, (2) stealing somebody else’s belongings, (3) having extramarital relationships, (4) telling lies, (5) imbibing liquor or drugs that would affect consciousness, (6) wearing accessories or perfume and enjoying music or dancing, (7) eating at the wrong time, and (8) sleeping on a high bed. Of the eight, the seventh requires the greatest effort because “wrong time” here means from noon until dawn of the following day; so people who hold the eight precepts have to maintain a half-day fast. Therefore, many laypeople prefer to keep the first five precepts and add the other three only on precept days. Lay ascetics in Cambodia often identify themselves as upāsaka/upāsikā. Lay ascetics keep the same precepts, but they keep the set of eight precepts every day and live in a temple all the time. In addition, they shave their hair and eyebrows and wear white robes. As mentioned above, female ascetics are called daun chi or yeay chi; male ascetics are called ta chi. As far as I have observed in temples in several provinces in Cambodia, while some temples have only monks, many temples have both daun chi and ta chi, and the ascetic population tends to be concentrated in a few temples in one region, not spread evenly. In addition, if a temple has any ascetics, the population of daun chi always outnumbers that of ta chi. So far, I have not ascertained the exact reason behind this gender imbalance, but I speculate that it might be due to the gender gap in religious practices as well as demography. First, men have the choice to become ordained as monks all through their lifetime regardless of their age if they wish to do so, whereas women do not; there have never been female monks in Cambodia. Second, according to the census, there are fewer widowed men than widowed women in Cambodia in the middle-aged and elderly population, so more men tend to stay at home with their spouses as ordinary laymen. This sub-section and the sub-sections of Section IV that follow are based on my 2011 survey conducted at three temples in Phnom Penh, where a comparatively large number of lay ascetics reside. Using the questionnaire sheets, the members of my survey team interviewed ascetics individually.26) Out of around 250 ascetics in total, I received data from 206: 195 females (95 percent) and 11 males (5 percent). To abstract gender elements from consideration, here I exclusively analyze the women, who predominated. Therefore, the percentages in the following description come from the denominator of 195. As Table 1 shows, 158 of the ascetics were in their sixties and over and accounted for 81 percent of the group. This tendency is identical to that of the lay ascetics as a wider group in Kien Svay District, Kandal Province; most female ascetics are elderly. Fifteen percent had never been married, while 68 percent had been married at least once but had lost their husbands through either death (58 percent) or divorce (10 percent). Interestingly, 16 percent of them were still married. This means that the husbands were either living at home (13 percent) or residing in a temple (3 percent) as male ascetics (ta chi), lay priests (achar), or monks. In cases where wife and husband resided in the same temple, they lived separately in different sections within the temple compound. Seventy percent had at least one living child, and 32.8 percent had four or more. It should be noted that some of these people may have been able to rely economically on their own child/children or had the choice of living with them in the future. In addressing the question of their future plans, 34 percent said they were planning to leave the temple and live with their close relatives or children when they were older, while 63 percent said they would stay in the temple as long as they lived. I did not ask specifically about previous annual income and so forth, but most of the lay ascetics were not from rich families, according to the interviews. Their previous occupations were wide ranging: farmers, vendors, public workers, housewives, etc. Elderly people in Cambodia in general have little education, and ascetics’ literacy levels reflect this. While 30 percent of them answered that they could “read and write well,” 32 percent of them answered that they could “neither read nor write at all.” The rest were able to “read a little but cannot write” or “read and write a little.” This literacy situation indicates that only a limited number of ascetics would be able to absorb Buddhist teachings through books. I did not include questions on ethnicity in the questionnaire. Each temple apparently had a number of people of Chinese descent, which we could sometimes tell by a person’s name or appearance—but all were Khmer nationals, and this was how they identified themselves. The ethnic factor did not seem to make any significant difference to the ascetics’ lives or human relationships within a temple, as far as I could observe. As Fig. 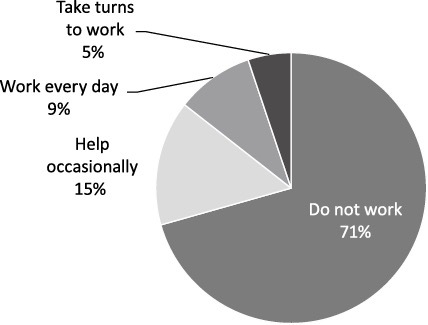 1 shows, the most frequent answer to the question “How do you supply your everyday food?” is “Self-supply” (either cooking or buying), at 81 percent. The answer “Receive temple food” (16 percent) refers to the case of Temple CK, where polished rice (uncooked) is distributed to ascetics. According to my own observations and interviews, even ascetics who usually cook by themselves eat temple food on precept days and Buddhist festival days, when temples have large amounts of food donated by ordinary laypeople outside. According to Fig. 2, while a limited number of ascetics (9 percent) work as cooks in the temple kitchen every day, the majority do not. The result I did not anticipate was that many of the ascetics offered food to monks (Fig. 3). 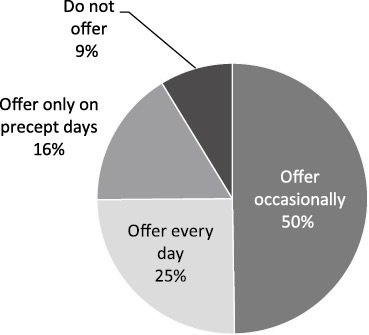 As many as 91 percent of them answered that they offered food to monks every day, occasionally, or on precept days. 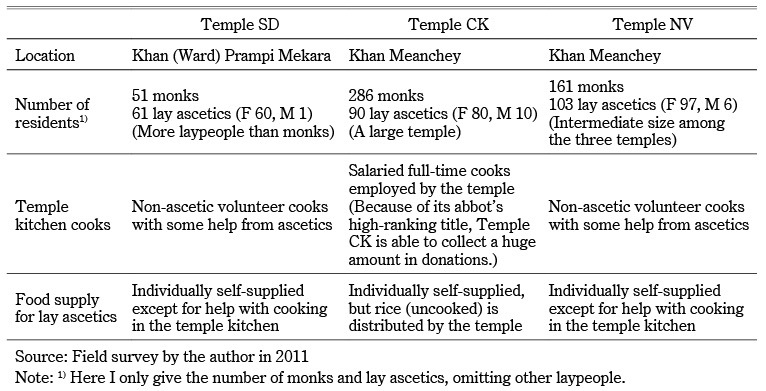 This reveals the ascetics’ dual characteristics: they are temple members, but at the same time they also remain in the lay category, so they still offer food to monks. The cash that ascetics need to buy food or materials for cooking, as Fig. 4 shows, comes most often from family or close relatives, and secondarily from donations (p. paccaya) they receive outside the temple when they are invited to funerals or other family rituals (29 percent). They receive donations from ordinary laypeople just as monks do, but they are supported mainly by their own family and relatives. Fig. 5 sheds light on another aspect of lay ascetics’ lives. We can see that the top category of expenditure is everyday food, which is understandable,28) but the second-most frequent expenditure is on donations to monks and temples. Making donations is certainly a major part of their temple life. Each female lay ascetic has a different way of securing food as well as cash for food and other expenditures. Following are some of the sources of supply among those who reside in Temple SD. I have only one daughter and a grandson. She is a single mother, employed as a maid and babysitter by a family in Phnom Penh. Although she has this stable job, her income is barely enough to make ends meet. Her son is grown up but jobless, so I cannot rely on him. After my daughter left Kampong Chhnang for Phnom Penh to work, I felt lonely and was not sure how to support myself. Sometimes I felt scared of ghosts and such things. I decided to come to Phnom Penh and start living in this temple as an ascetic in order to strengthen my mind and to be near my daughter. My daughter was also happy because this temple is not very far from her workplace. As a matter of fact, she stayed with me in this room for two years as an ascetic. She eventually stopped being an ascetic and went outside to work again because she needed to earn money. I share this room with several other ascetic women, but we prepare meals separately. Usually, I eat rice porridge for breakfast and cooked rice and a couple of dishes for lunch. I occasionally receive some portion of the dishes prepared for monks in the temple kitchen, but I usually go to the market by motorbike taxi to buy groceries and cook for myself. For my expenditures, my daughter gives me 40,000 to 50,000 riel a month. Another source of income is donation money that laypeople give us, but such donations are not regular. When I was much younger I used to be invited to laypeople’s houses for funeral chanting and received donations, but I do not go nowadays because of my health condition. I have gallstones. I do not think I will have an operation, because I am too old, but I need medication. This temple does not provide us with any medical support, but my daughter has given me about $500 in total for my medical fees. Her employer is so kind that he drives me to the hospital. My daughter lives a busy life but visits me at least once a month to give me some delicious food, help me bathe, and so forth. She says it is her employer who buys the food for me. Several monks come to this temple for alms. Only when I have freshly cooked food or a lot of food from my daughter do I give some to them. I have lived in this temple since I was over 60 years old. I became an ascetic because I wanted to be able to chant sutras. My husband died during the Pol Pot regime. I had 12 children: seven sons and five daughters. Sad to say, I lost all the sons—but the five daughters survived. My daughters are all married and living in Phnom Penh. This temple is located near their houses. That is why I chose this temple to live in. If I need any help, I can call them and ask them to come here any time. Of the five, the second and third daughters are richer than the others and give me more financial support. All five visit me, but because they are quite busy, when they come to give me something to eat, they leave the food and return very quickly. If the daughters are too busy my grandchildren come instead. This morning one of my grandchildren came to bring me a pot of soup. The two weeks of the phchum ben period is the exception; all the daughters visit me one after another and stay longer. Anyway, my daughters or grandchildren bring the rice and dishes that are my main food every two or three days. They also buy me the medicine that I need. Sometimes I cook for myself if necessary. I give some money to a temple cook and ask her to buy groceries when she goes to the market. I just broil fish and cook simple dishes when the food from my daughters is not enough. For this, they give me around $10–20 in cash every month. I do not cook every day, so I can rarely offer food in the alms bowls of the monks who come to this temple. When I was younger I used to be invited to funerals often, but these days I do not go because I am too old. If I sit on the floor for long while chanting, I cannot stand up by myself. Therefore, I usually have no occasion to receive donation money from laypeople, but the phchum ben period is different. A layperson will give me a donation, on average, of 3,000 to 5,000 riel at a time. Before I came to this temple to live, around 1993, I stayed home, keeping the lay precepts. In those days, Ven. Pal Haun was the abbot of this temple.29) There were not many monks, but there were more than 100 female ascetics. I often used to come to this temple to do volunteer work. Knowing that I had no husband or children to rely on, Ven. Pal Haun recommended that I live here. I was not yet old, but I decided to become an ascetic and live in this temple because I realized that it was my way of life to serve the three gems (i.e., the Buddha, dhamma, and saṅgha). When I was very healthy, I was often invited to laypeople’s rituals, including funerals, where I recited chants and received donation money; but now I rarely go to chant because my knees and back ache if I stay seated on the floor for too long. I have no direct descendants, but I have four nephews and nieces who are related to me by blood. All of them are the children of my sister, who passed away. Among them, one nephew supports me continuously. He lives in Otdar Meanchey Province in the northern region and sends me rice and money via a bus driver whom he trusts. I receive $50 a month. This nice hut where I live over here was given by its former owner who stayed in this temple as an ascetic but later immigrated to Australia. Now she comes to visit me every year and gives me $20. I expanded this hut into a two-storied one with a ladder and a bigger roof using money donated by my friends and acquaintances, my nephew’s wife, and so on, together with my own savings. I live alone, but I often host acquaintances who need one night’s stay on a precept day or who want to stay for three months of the Lent season as short-term ascetics. I became acquainted with them in this temple, so even though I have no family I do not feel lonely. I go to the market for groceries and cook for myself. The market people know me very well, so they sometimes give me extra food for the same price. Almost every day, I offer food to three monks who belong to another temple and commute to this temple for alms. Sometimes I also offer food to the young monks of this temple who have missed breakfast because of their busy study schedules. I take part in ven for this temple, so I cook in the temple kitchen five times a month. I’ve also enrolled myself in a group of ven with about 300 members that fulfills part of ven for as many as 28 temples. I support the group by paying 10,000 riel per month. In addition to working to fulfill ven, I keep learning dhamma. I often go to other temples to listen to lectures by a dhamma teacher. I am deeply satisfied with my temple life and feel very happy. 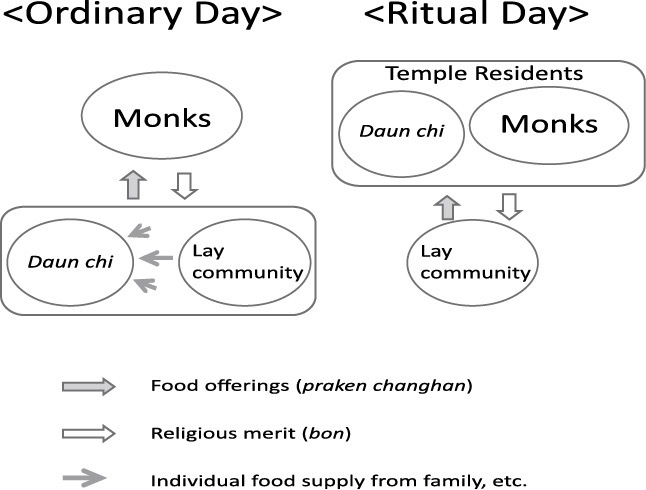 Food for monks and lay ascetics is supplied via different systems that are connected to each other by means of various apparatuses—economic necessities and religious values (Fig. 6)—and the food for temple residents as a whole is well provided and maintained. Monks, who never get involved in productive labor, entrust laypeople with everything related to food. Aside from direct food offerings to the monks, such as mendicancy and meals served at laypeople’s houses at rituals, daily meals for monks in temples in urban areas are supported by shared ven, for which the labor and management are provided by faithful laypeople and ascetics. The food supply for lay ascetics is more varied because such people are not restricted by vinaya. A number of needy ascetics depend on the temple kitchen for food to some extent. Some get enough food by providing their own labor in the temple kitchen, but most ascetics secure their food through support from their family and close kin. They also get a cash income in donations from the laypeople who invite both monks and ascetics to their family rituals. It is worth noting that while lay ascetics manage to secure their own food in either of the above ways, many of them still try to offer food to monks by cooking personally, helping in the temple kitchen, or joining a ven group. They are food receivers but at the same time play a part in food provision. Regarding the relationship between monks and laypeople in general, all the food (and money) for the former comes from the latter, and the donated food is offered to all the monks of the temple, not to individuals. Even the food put into alms bowls during mendicancy is shared at meals. Lay ascetics, too, are sometimes invited to laypeople’s houses together with monks and receive donations, but only as part of their role of being attached to a group of monks. They do not practice mendicancy and are not supported by ven. Therefore, lay ascetics need to seek way(s) of supporting themselves on an individual basis. In the process of doing this, some ascetics, like daun chi C in the previous section, can create new personal relationships with other laypeople outside the temple through their religious practices. For lay ascetics, the temple is not only a place for religious practices, such as sutra chanting, meditation, and listening to dhamma talks, but also a place where they live a peaceful life during their old age as faithful Buddhists; consequently, many of them include food offerings to monks in their practices. Some offer food to monks once in a while when they receive large amounts of food from their family or kin members, some become involved in temple ven and cook regularly for monks, and some take responsibility in the management of ven, which involves many laypeople outside the temple. All of these practices are considered to accumulate merit, which is quite important for ascetics, who are mostly elderly, because their remaining time will not be long. The fact that a number of temples in Cambodia have lay residents living in them means that Cambodian Buddhists have multiple choices in their practice all through life, so they always have the opportunity to become involved, in various positions that they can choose, in receiving and supplying food, one of the most fundamental and important practices in the sustenance of Buddhist temples and Buddhism itself. The discussion above regarding food supply for monks and lay ascetics leads first to rethinking the significance of lay ascetics in Cambodia. A Buddhist temple has been considered to be a monastery where (male only) monks reside. Few other research works on lay ascetics in Cambodia have appeared so far, and the section of the Cambodian administration that is involved in religious affairs did not show any interest until 2009.30) Using the annual statistics of temples and temple residents issued by the Ministry of Cults and Religion in 2009 as an example, it is clear that not all of the provinces reported the population of lay ascetics, which means that the number of lay ascetics was not regarded as requisite data. From the facts I have presented in this article, we can see that female ascetics play a significant role in temples and in the wider Buddhist communities surrounding each temple, especially in urban areas. For female ascetics, a Buddhist temple is relevant for three reasons: (1) being Buddhist disciples, female ascetics can engage in practices such as sutra chanting, meditation, etc. ; (2) being advanced-level precept keepers, they can become merit-making targets for laypeople in general, just like monks; and (3) being in the lay category, they can serve monks by becoming involved in food supply in a direct or indirect way. To sum up, lay ascetics have their own roles and activities, including food supply, and they are not completely dependent on monks. Second, it should be noted that the condition of lay ascetics has been changing and is continuing to change, albeit gradually. Cambodian people in general share a common image of lay ascetics as being pitiful old people who have no family to rely on and no other choice but to stay in the temple for the rest of their lifetime. This was true to some extent in the 1990s, just after the UNTAC period; I personally encountered numerous such cases. However, it is not always the case any more. There are probably more and more ascetics who prefer to stay in a temple for a limited number of years and then move on to their daughter’s (or other kin’s) house to live out their remaining years. In short, most of them are not alone. Third, I would like to suggest that we should look at temple residents from the perspective of the life course. Being a monk or a layperson is not usually a lifelong status. In today’s Cambodia, it is no longer a social norm for young men to become monks either. The decision to become a monk or a lay ascetic is made by the person himself/herself, not by force. Therefore, people’s choices in Buddhist practices can change in accordance with their life stage, family environment, preferences, etc. A man might become ordained as a monk, stay in the monkhood for several years, disrobe and get married, visit temples occasionally, and start living in a temple again as a lay ascetic in his old age. The statuses of monk, ascetic, and ordinary layperson can be chosen one after another during the course of a person’s life. Although monkhood is not yet open to women in Cambodia, it should be noted that there are some female ascetics who have considerable knowledge of Buddhism and give lectures to monks and laypeople.31) For some of these people, becoming a learned ascetic may be an option in the future. This work was supported by the Japanese Society for the Promotion of Sciences KAKENHI, Grant numbers 23520997 and 20251003. I would like to express my sincere gratitude to all those who answered my endless questions and cooperated in the questionnaire, especially the laypeople in Temples SD, CK, and NV. Buddhist Institute, Cambodia. 2006. The Situation of Daun Chi in Cambodia. Phnom Penh: Buddhist Institute. Cambodia, Ministry of Cults and Religion. 2013. Kamrong Aekasa Sthete Vat Vihear Sala ning Samanasoes-Nissit កម្រងឯកសារស្ថិតិវត្ត វិហារ សាលា និងសមណសិស្ស-និស្សិត [Compiled statistics of temples, schools, and monk students]. Phnom Penh: Ministry of Cults and Religion, Cambodia. ―. 2009. Sthete Vat Asram Putthamondol Vipassanathurea Preahsang Preahanukon Preahmekon Preahreacheakena Tuteang Preahreacheanachak Kampuchea ស្ថិតិ វត្ត អាស្រម ពុទ្ធមណ្ឌល វិបស្សនាធុរៈ ព្រះសង្ឃ ព្រះអនុគណ ព្រះមេគណ ព្រះរាជាគណៈ ទូទាំងព្រះរាជាណាចក្រកម្ពុជា [Statistics of Buddhist institutions and monks in the Kingdom of Cambodia]. Phnom Penh: Ministry of Cults and Religion, Cambodia. Mimeographed. Cambodia, Ministry of Cults and Religion, Neayokathan sravchreav phsapphsay putsasna phsaphchoap sangkom នាយកដ្ឋានស្រាវជ្រាវផ្សព្វផ្សាយពុទ្ធសាសនា ផ្សារភ្ជាប់សង្គម [Department of Buddhism Publicity and Social Relations]. 2012. Kram Soelathoa ning Vithi Pratebat robos Daun chi ក្រមសីលធម៌និងវិធីប្រតិបត្តិរបស់ដូនជី [Morals and way of practice of daun chi]. Phnom Penh: Ministry of Cults and Religion, Cambodia. Crosby, Kate. 2014. Theravada Buddhism: Continuity, Diversity, and Identity. Chichester: Wiley-Blackwell. Falk, Monica Lindberg. 2007. Making Fields of Merit: Buddhist Female Ascetics and Gendered Orders in Thailand. Seattle: University of Washington Press. Guthrie, Elizabeth. 2004. Khmer Buddhism, Female Asceticism, and Salvation. In History, Buddhism, and New Religious Movements in Cambodia, edited by John Marston and Elizabeth Guthrie, pp. 133–149. Honolulu: University of Hawai‘i Press. Hamaya Nobue 浜家伸恵. 2004. “Tera ni Kurasu” to Iu Ikikata: “Seido” no Moto de “Kesson” o Oginau Kambojia Josei Shugyosha no “Kurashi”「寺に暮らす」という生き方―「制度」のもとで「欠損」を補うカンボジア女性修行者の「暮らし」[The way of life of “living in a temple”: “Lives” of Cambodian female ascetics who fulfill “losses” under the “institution”]. MA thesis, Okayama University. Hansen, Anne Ruth. 2008. How to Behave: Buddhism and Modernity in Colonial Cambodia 1860–1930. Chiang Mai: Silkworm Books (originally published by University of Hawai‘i Press, 2007). Harris, Ian. 2005. Cambodian Buddhism: History and Practice. Honolulu: University of Hawai‘i Press. Hayashi Yukio 林行夫. 1998. Kambojia ni okeru Bukkyo Jissen: Ninaite to Jiin no Fukko カンボジアにおける仏教実践―担い手と寺院の復興 [Buddhist practices in Cambodia: People in charge and recovery of temples]. In Kambojia: Shakai to Bunka no Dainamikkusu カンボジア―社会と文化のダイナミックス [Cambodia: Dynamics of its society and culture], edited by Hisatoshi Ohashi 大橋久利, pp. 159–219. Tokyo: Kokonshoin. Ishii Yoneo 石井米雄, ed. 1991a. Koza, Bukkyo no Juyo to Henyo 2: Tonan Ajia Hen 講座・仏教の受容と変容 2―東南アジア編 [Lecture series, acceptance and transformation of Buddhism 2: Southeast Asia]. Tokyo: Kosei Publishing. ―. 1991b. Tai Bukkyo Nyumon タイ仏教入門 [Introduction to Thai Buddhism]. Tokyo: Mekong Publishing. Jacobsen, Trude. 2013. In Search of the Khmer Bhikkunī: Reading between the Lines in Late Classical and Early Middle Cambodia (13th–18th Centuries). Journal of the Oxford Centre for Buddhist Studies 4: 75–87. Khy Sovanratana. 2008. Buddhist Education Today: Progress and Challenges. In People of Virtue: Reconfiguring Religion, Power and Moral Order in Cambodia Today, edited by Alexandra Kent and David Chandler, pp. 257–271. Copenhagen: Nordic Institute of Asian Studies. Kobayashi Satoru 小林知. 2013. Kambojia Noson ni okeru Bukkyo Shisetsu no Shurui to Keisei Katei カンボジア農村における仏教施設の種類と形成過程 [A study of Buddhist places of worship in rural Cambodia: With a special focus on their differences and formative processes]. Tonan Ajia Kenkyu 東南アジア研究 [Southeast Asian studies] 51(1): 34–69. ―. 2011. Kambojia Sonraku Sekai no Saisei カンボジア村落世界の再生 [Reformation of the rural world in Cambodia]. Kyoto: Kyoto University Press. ―. 2009. Poru Poto Jidai Igo no Kambojia Bukkyo ni okeru So to Zoku ポル・ポト時代以後のカンボジア仏教における僧と俗 [Monks and laymen in Cambodian Buddhism after the Pol Pot era]. In “Kyoiki” no Jissen Shukyo: Tairikubu Tonan Ajia Chiiki to Shukyo no Toporoji〈境域〉の実践宗教―大陸部東南アジア地域と宗教のトポロジー [Practical religions in mainland Southeast Asia: Topology of religion from the region and “in-betweenness”], edited by Yukio Hayashi 林行夫, pp. 27–65. Kyoto: Kyoto University Press. ―. 2008. Reconstructing Buddhist Temple Buildings: An Analysis of Village Buddhism after the Era of Turmoil. In People of Virtue: Reconfiguring Religion, Power and Moral Order in Cambodia Today, edited by Alexandra Kent and David Chandler, pp. 169–194. Copenhagen: Nordic Institute of Asian Studies. ―. 2005. An Ethnographic Study on the Reconstruction of Buddhist Practice in Two Cambodian Temples: With the Special Reference to Buddhist Samay and Boran. Tonan Ajia Kenkyu 東南アジア研究 [Southeast Asian studies] 42(4): 489–518. Ledgerwood, Judy. 2008. Buddhist Practice in Rural Kandal Province 1960 and 2003: An Essay in Honor of May M. Ebihara. In People of Virtue: Reconfiguring Religion, Power and Moral Order in Cambodia Today, edited by Alexandra Kent and David Chandler, pp. 147–168. Copenhagen: Nordic Institute of Asian Studies. ―. 2002. Cambodia Emerges from the Past: Eight Essays. DeKalb: Southeast Asia Publications, Center for Southeast Asian Studies, Northern Illinois University. Onozawa Masaki 小野澤正喜. 1995. Shukyo to Sekaikan 宗教と世界観 [Religion and worldview]. In Motto Shiritai Tai もっと知りたいタイ 第2版 [The Thailand that we want to know more about] (2nd ed. ), edited by Tsuneo Ayabe 綾部恒雄 and Yoneo Ishii 石井米雄, pp. 103–147. Tokyo: Koubundou Publishers. Sakamoto Yasuyuki 坂本恭章. 2001. Kambojia-go Jiten カンボジア語辞典（上）（中）（下） [Cambodian-Japanese Dictionary (I) (II) (III)]. Tokyo: Research Institute for Languages and Cultures of Asia and Africa, Tokyo University of Foreign Studies. Takahashi Miwa 高橋美和. 2014. Kyodan ni Tatsu Zokujin Josei Shugyosha: Kambojia Bukkyokai ni okeru Josei no Shinshutsu Doko 教壇に立つ俗人女性修行者―カンボジア仏教界における女性の進出動向 [Female lay ascetics as teachers: Current situation of women in Cambodian Buddhist circles]. Tokyogaidai Tonan Ajia Gaku 東京外大東南アジア学 [Tokyo University of Foreign Studies Southeast Asian studies] 19: 128–146. ―. 2013. Shoku no Kyokyu to Jizoku kara Mita Kambojia Bukkyo Jiin: Zokujin Shugyosha ni Chumoku Shite 食の供給と持続から見たカンボジア仏教寺院―俗人修行者に注目して [Cambodian Buddhist temples from the viewpoint of food supply and maintenance: With special reference to lay ascetics]. Sogo Ningen Kagaku 総合人間科学 [General human science] 1: 91–105. ―. 2012. Zokujin Josei ga Jiin Zumai no Shugyosha ni Naru to Iu Koto: Kambojia ni okeru Don Chi to Haha Musume Kankei 俗人女性が寺院住まいの修行者になるということ―カンボジアにおけるドーンチーと母娘関係 [Lay women as Buddhist temple inhabitants: Daun chi in Cambodia from the viewpoint of mother-daughter relationships]. Aikoku Gakuen Daigaku Ningen Bunka Kenkyu Kiyo 愛国学園大学人間文化研究紀要 [Human and cultural sciences: Journal of Aikoku Gakuen University] 14: 1–12. ―. 2011. Josei to Bukkyo Jiin 女性と仏教寺院 [Women and Buddhist temples]. In Sei to Do no Bukkyo 静と動の仏教 [Buddhism of statics and dynamics], edited by Yasuaki Nara 奈良康明, Masahiro Shimoda 下田正弘, and Yukio Hayashi 林行夫, pp. 415–449. Tokyo: Kosei Publishing. ―. 2009. Shukke to Zaike no Kyoiki: Kambojia Bukkyo Jiin ni okeru Zokujin Josei Shugyosha 出家と在家の境域―カンボジア仏教寺院における俗人女性修行者 [Boundary sphere between monks and laypersons: Female lay ascetics in Buddhist temples in Cambodia]. In “Kyoiki” no Jissen Shukyo: Tairikubu Tonan Ajia Chiiki to Shukyo no Toporoji〈境域〉の実践宗教―大陸部東南アジア地域と宗教のトポロジー [Practical religions in mainland Southeast Asia: Topology of religion from the region and “in-betweenness”], edited by Yukio Hayashi 林行夫, pp. 359–409. Kyoto: Kyoto University Press. ―. 2006a. Konnichi no Kambojia Bukkyo Jiin to Zokujin Josei: Nikushin Soshitsu Taiken o Koete 今日のカンボジア仏教寺院と俗人女性―肉親喪失体験をこえて [Cambodian Buddhist temples and women today: Beyond family loss experiences]. Ajia Yugaku アジア遊学 [Exploring in Asia] 89: 60–71. ―. 2006b. Gendai Kambojia ni okeru Zokujin Bukkyoto no Shukyo Jissen to Jinsei: Josei Shugyosha (Don Chi) o Chushin ni 現代カンボジアにおける俗人仏教徒の宗教実践と人生―女性修行者（ドーンチー）を中心に [Religious practices and lives of lay Buddhists in Cambodia today: Focusing on female ascetics (daun chi)]. In Tonan Ajia Tairikubu, Seinan Chugoku no Shukyo to Shakai Henyo: Seido, Kyoiki, Jissen 東南アジア大陸部・西南中国の宗教と社会変容―制度・境域・実践（科学研究費補助金（基盤A）平成15～17年度研究成果報告書）[Religions and social transformation in continental Southeast Asia and Southwestern China: Institutions, boundaries, practices]. Report of the Research Grant-in-aid by the Japanese Society of Promotion of Sciences: Years Heisei 15–17, edited by Yukio Hayashi 林行夫, pp. 616–651. Takeda Ryuju 武田龍樹. 2010. Gendai Kambojia ni okeru Bukkyo Tokushinka tachi: Porupoto Jidai Igo no Tobu Sonrakubu o Jirei ni 現代カンボジアにおける仏教篤信家たち―ポルポト時代以後の東部村落部を事例に [Lay Buddhist devotees in contemporary Cambodia: A case study of a village in the eastern part of Cambodia after the Pol Pot era]. Shukyo to Shakai 宗教と社会 [Religion and society] 16: 65–87. Thomson, Ashley. 2006. Buddhism in Cambodia: Rupture and Continuity. In Buddhism in World Cultures: Comparative Perspectives, edited by Stephen C. Berkwitz, pp. 129–167. Santa Barbara: ABC-CLIO. Yamazaki Sumiko 山崎寿美子. 2011. Kambojia no Rao Sonraku ni okeru Kyogo to Shakai Keisei: Soryo no Ue no Jirei kara カンボジアのラオ村落における競合と社会形成―僧侶の飢えの事例から [Competition and society formation process in a Lao village of Cambodia: A case study of food shortage for monks]. Nempo Tai Kenkyu 年報タイ研究 [Journal of Thai studies] 11: 47–64. Agence Kampuchea Presse (AKP). 2013. Preah reachdamnang baoek anusang vacchara mohasannibat montrei sang tuteang prates loekti 22 ព្រះរាជតំណាងបើកឣនុសំវច្ឆរៈមហាសន្និបាតមន្ត្រីសង្ឃទូទាំងប្រទេសលើកទី២២ [Royal representative opens 22nd national congress of Buddhist monks], accessed January 3, 2014, http://www.akp.gov.kh/kh/?p=71854. 1) Some researchers call female lay ascetics in the Theravada region “nuns” or “precept nuns” (Crosby 2014, 230) in English. Kate Crosby (2014) has given her view on the general condition of female ascetics in the Theravada region. 2) Trude Jacobsen (2013) has studied inscriptions of the thirteenth to eighteenth centuries and provided a historical analysis. 3) “Daun chi” is often used as an official term for female lay ascetics. 4) Association of Nuns and Lay Women in Cambodia. By providing selected daun chi with training on Buddhist values and human rights, the association aims to nurture them so that they can contribute to DV counseling, HIV/AIDS prevention, and other solutions to social problems. ANLWC has two training centers, in Kep and Kandal Provinces, and branches in 14 provinces, according to my interview in 2011. Its activities, however, have had to be reduced since aid from the Heinrich Böll Foundation, its main donor, ended in 2005. 5) “p.” indicates the Pāli language. In this paper, for terms of Pāli origin related to Buddhism, I give priority to the Pāli spelling over Khmer (Cambodian) transcription, but non-Pāli key terms are transcribed in the Roman alphabet with their original Khmer script (when mentioned for the first time), based on the transcription system used by Judy Ledgerwood (2002). 6) In reality, the relations between the two kinds of aspiration are not that simple. For example, in both Thailand and Cambodia, even becoming a monk is considered an opportunity to make a lot of merit. I should discuss the meaning of “merit making” more in detail and also in the context of gender, but would like to do so in a future article. For the relationship between gender and “fields of merit” in Thailand, see, for example, Falk (2007). 7) Temple SD is located in the central area of Phnom Penh City. In 2009 the addresses of Temple CK and Temple NV were in Kien Svay District, Kandal Province, so both were included in the second as well as third categories of sources. The commune where the two temples are located has since been incorporated into Phnom Penh City due to the provincial border changes of September 2010. 8) For details on the varieties of Cambodian Buddhist institutions, see Kobayashi (2013). 9) This number is taken from the AKP article that reported the opening of the 22nd national congress of executive monks (anusang vacchara mohasannibat montrei sang tuteang prates) held on December 17, 2013. 10) Using the data taken in 2008 (before the provincial border changes) as an example, Kandal Province, which consists of 155 communes, had 395 temples. One commune had an average of 2.5 temples (Cambodia, Ministry of Cults and Religion 2009). 11) ឆាន់ (chan) means that monks “eat”; a different word is used for eating by non-monks. There are many other special verbs, nouns, and pronouns for monks. 12) The ordination to become a bhikkhu can be postponed if the candidate sāmaṇera thinks that he is not yet ready. When an elderly man wants to become a new monk, it is very common for him to be a sāmaṇera for a while to prepare for full ordination. 13) The source is the same as in footnote 9. 14) For this joint research project, supported by JSPS 20251003 “Time-Space Mapping of Buddhist Societies in Mainland South East Asia” (project leader: Yukio Hayashi), Kobayashi covered four districts in Kampong Thom Province, and I was in charge of Kien Svay District in Kandal Province. 15) This disproportionate age distribution is one reason for the lack of teachers in the Buddhist education system today (Khy Sovanratana 2008; Kobayashi 2009). 16) There are several kinds of achar, according to specialty: an achar of wedding ceremonies, an achar of funerals and cremations, and so forth. An achar of a temple is one such specialty. 17) In Cambodia, only monks use low tables for meals. Laypeople sit on the floor or on a chair when eating. Monks have different styles of having meals. For example, when they are invited to a layperson’s house for a family ritual, one tray full of dishes is prepared for each monk. Monks who practice dhūtaṅga (wandering in the forest for spiritual training) eat food from the alms bowl directly by hand without plates or a spoon. 19) The main festivals besides phchum ben are: the māgha pūjā (February or March), the Khmer new year (April), the visākhā pūjā (April or May), the beginning of rainy season retreat (July), the end of rainy season retreat (October), the kaṭhina (October or November), and the “flower festival” held periodically for fund-raising. 21) Calculated by the number of temples and monks in the data taken in 2008 (Cambodia, Ministry of Cults and Religion 2009). 22) In the fresh food market, fish and chickens are usually sold live. 23) The riel is the Cambodian currency, but US dollars are also widely accepted in markets. In 2013, US$1 was equivalent to about 4,000 riel. Polished rice retails for around 2,500 riel per kilogram in Phnom Penh. 24) It should be noted that this ascetic chief is from a rich family, unlike ascetics in general. 25) Temple SD does not have a lay committee. Several achar, the chief, and the vice chief of daun chi fulfill the duties instead. 26) For the interviews, the research team, which consisted of nine native Cambodians, worked with me. This team included graduates of Royal Phnom Penh University, elementary school teachers, and high school teachers. 27) In my interviews, people said that the population of lay ascetics increased sharply from the late 1980s until the early 1990s, at the end of the civil war period. In those days, many people may have begun living in temples in order to secure food. 28) This does not mean the highest in price. 29) Pal Haun was a well-known monk in the rite of “pouring sacred water (ស្រោចទឹក)” for laypeople during the 1990s. He was not only successful in rebuilding Temple SD using money donated for water pouring but also kept supporting laypeople such as daun chi and male students from the provinces by providing accommodation in the temple. 30) The Ministry of Cults and Religion, following the instructions of Prime Minister Hun Sen, started training seminars for achar in 2009. In 2012 the ministry also started another seminar series for female ascetics. These events may show that the Cambodian government began to recognize the significance of lay monastic members. See also Cambodia, Ministry of Cults and Religion, Department of Buddhism Publicity and Social Relations (2012) and Takahashi (2014). 31) I made a preliminary analysis of a sign of change in Cambodian Buddhist society brought by such learned daun chi in another paper (Takahashi 2014).